Venice in its long and colorful history has many mysteries, but one is about to the solved. In about 1172, a good 320 years before America was discovered, the Venetians (Doge Vitale Michiele II) who had helped Byzantium win the war against the Phoenicians received a reward of three granite columns and a lot of other loot. Venice in turn as a thanks for bringing back the columns Doge Michiele was allowed to add “dalle Colonne” to his last name and hand this title down to his heirs. Each one of the columns weighed over 100 tons. How many of those small boats they rowed around the Adriatic were needed is not known. But upon arrival in the Venetian lagoon, these monsters had to be unloaded. And there’s where the mystery begins. Needless to say, the tools available to the Venetians did not include cranes. Human hands and cables made of hemp were their tools. 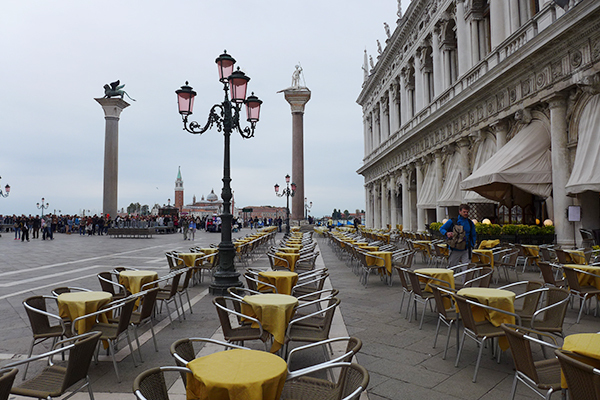 The unloading didn’t go as planned and one of the columns sunk right there at the front of San Marco. And probably someone went to the prison! The Venetians lost interest in the other two columns (the ones you see standing today) as they were too heavy to move, probably many committee meetings deciding what to do with these treasures and they lay on the waterfront for years. The doge issued a proclamation that an “onesta grazie” would be granted to whomever could erect them on the piazzetta. Nicolo Barattieri, who also built the first pontoon bridge at the Rialto took on the challenge. He used heavy ropes which he had soaked and as they dried, he lifted in small increments. With the successful uprighting of the two columns, he named his “onesta” the right to set up gaming tables between the columns. Apparently, his gaming business was a huge success. So to dissuade Barattieri’s gambling business the Doge gave an order that all public executions should take place between the 2 columns. The sight of bodies hanging must have put a damper on the prospects of winning big at gambling. Since this glorious period, two attempts have been made to raise the third column, one in 1559 and another in 1809. They obviously did not meet with success. 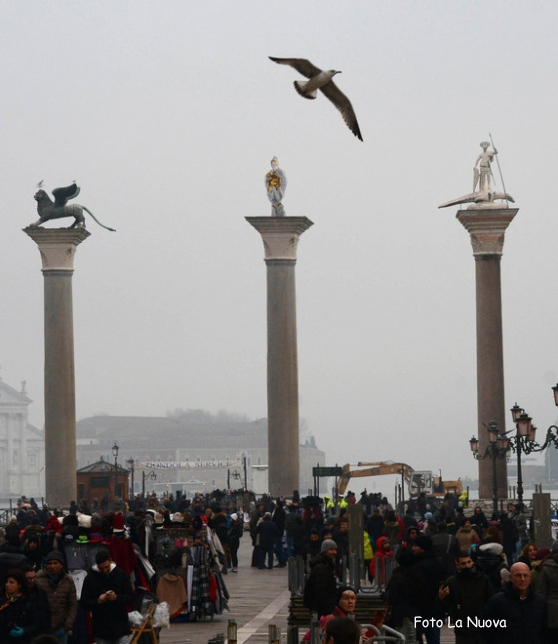 Venice has given the OK to Venetian diver Roberto Padoan to a noninvasive search which currently only involves the mapping the location, surveying the column and the installation of sensors. Of course the concern is the fragile foundation of the piazza where it meets the water. They are attaching small instruments to the surrounding foundations to be sure no damage is done. After this first phase is complete, it will be the city officials who approve the actual recovery and debate the question of costs. Currently it is rumored that a international organization is interested in documenting the entire process and would pay for this right. The recovery will begin with cleaning the mud and debris of more than 800 years. The recovery would involve Teflon sheeting similar to a sling attached to lifting cables, all very delicate tasks. Deciding where to put the third column is another question, given its immense weight and the size and weight of the cranes must be considered. The artist view is shown in the picture below, but exact location and figure on top are still under consideration. When these columns were placed, Venice’s only entrance to the city was by boat and right through the two columns to be welcomed (or not) by the Doge. 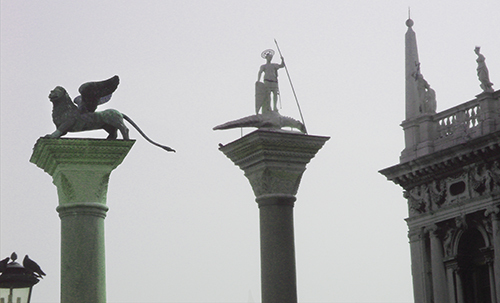 The two columns were said to have symbolized the perennially open doors of the city, but with three, well Venice will have to come up with a new story! And what do you think will go atop of the column? Guess we’ll have to wait and see. What a pity no local official dredged up and acted upon that same concern of damage caused by the many cruise ships that now foul the harbor and cause unseen harm to Venice’s substructure! You know I had those same thoughts myself as I was writing the article.